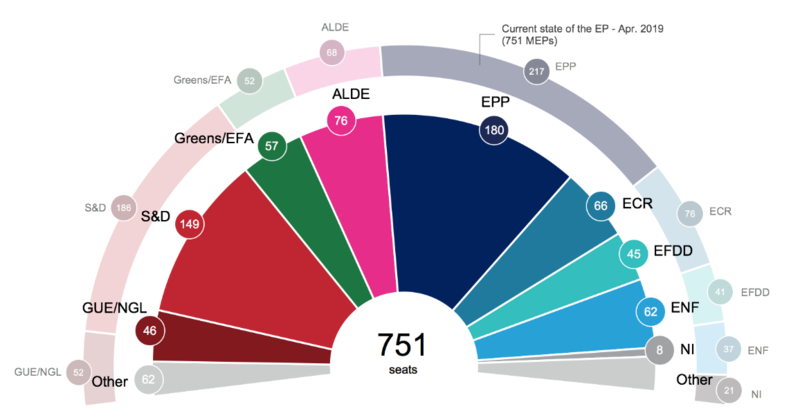 The European Parliament has published a new set of projections on how the next chamber might look, based on polling data published in 28 EU member states until 15 April 2019. The data are based on a collection of reliable polls conducted by national polling institutes in the member states and aggregated by Kantar Public on behalf of Parliament. The data from the previous projection, published on 29 March, have also been updated to recalibrate with UK data to facilitate comparison with the new scenario of the UK participating in May’s elections. Parties are only allocated to existing political groups or where they are already affiliated to an associated European political party. All new political parties and movements that have not yet declared their intentions are categorised as “other”. All data can be downloaded from the press tool kit. The European elections will take place from 23 to 26 May.